WHAT’S IN THE BOXThe following are the items being harvested this coming week. Items and quantities in your box may vary depending on your harvest day and the total harvest of each crop. The boxes are completely governed by what is ripe and ready for harvest and how much of it there is. We endeavour to divide the harvest fairly. NOTES ON WHAT'S GROWING With these strangely warm days, we are very eager to sow most of the growing fields with cover crops before the weather becomes too cold for them to germinate. About half the farm has been sown so far...with the recently sown oats about an inch high! The garlic for next year has sprouted as have the broad beans for the Spring Share. 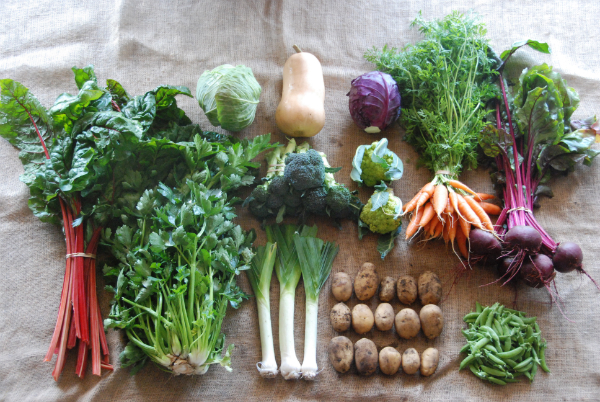 Including this week, there are three more weeks of the Autumn Share and there is still so much food growing. There will be lettuce for next week...might even make it into Wednesday's boxes depending on these warm days. And you may find a few surprises in your boxes over the next weeks as we continue to clean out plantings. If you are unsure of anything your receive, please send us an email or ring. Growing for the Autumn Share has been a bit tricky as far as the timing of planting and the timing of harvesting. Things came on really quickly in the early Autumn and now everything has slowed right down. A CSA is different then harvesting for a market. Our planting is planned on having 10-12 items each week ready for harvest. Our notes from previous seasons really did not help us with such a warm April. Many of the crops we thought would hold for several weeks were going by. And so we planted more crops to compensate and their growth has slowed down. There will always be something unexpected when you work with nature! A farmer in America told us, "Farming is different from most other professions. In any profession, you try and find better ways to do tasks. But for us, as farmers, we have to wait until next season to implement that "better way". I have been farming for 25 years, I have grown tomatoes 25 times. It doesn't seem like that many times to improve a system!" SEASONAL EATING - SHARING INSPIRATION Please keep sharing your inspirations. As we really shift away from the light hungry, heat loving plants, I feel grateful to have had a summer harvest which blessed us with pumpkins, beans, zucchini, cucumbers, tomatoes, corn - Which made the soil warm enough to grow our root crops for harvesting through the winter - and compost still rotting with the warmth. True seasonal eating has lost its definition, due partly to the fact that the grocery stores and fruit and vegetable shops seem to have everything, all the time. It is great to be a part of the re-awakening of eating with the season and I am enjoying compiling what that looks like for so many different families. So, please, delight us with your silver beet stews, cauliflower curries, broccoli soups and pumpkin, spinach and ricotta lasagnas!